After nearly 20 years of plugging away, I have finally landed a publisher who has just produced my first major collections of haiku. And the Almanackery is invited to the launch! On Friday 16th December, I will be launching not one but TWO books of haiku. One of the books, Down to the Wire, is a collection of footy haiku drawn almost exclusively from the match reports I have shared with The Footy Almanac community over the past eight or so years. I owe a lot to the Almanac, in particular to John Harms, for giving footy haiku a home, and I’d love to see some of you at the launch. or see below for details. Come and celebrate the launch of Rob Scott’s first major collections of haiku and senryu. 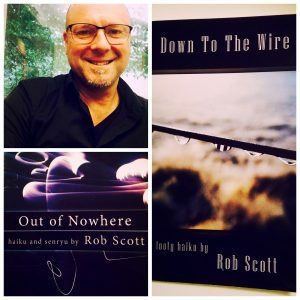 Rob will be launching two books, Out of Nowhere – a collection of haiku and senryu, and Down to the Wire – a compilation of his popular footy haiku, both published by Red Moon Press, one of the leading publishers of haiku in the world. Rob will read extracts from both books, and there will be music and refreshments. Where: The Grumpy Swimmer Bookshop, 110 Ormond Rd, Elwood. Congrats on the book… Cricket permitting I will come by. G’day HB. Outstanding effort. Great to see that your pearls are going into print. Would love to come to the launch but not certain that Friday. Good luck with it if I can’t make it. Kate – Thanks! Hope you can make it. Dips – Thanks and no worries! One Hundred Great Books in Haiku, by David Bader (Penguin, 2005). needed to have read them all.